Hiccup and Toothless return in a poignant capper to this accomplished trilogy, with voice work from America Ferrera, Cate Blanchett and Jay Baruchel. In the final installment of the rewarding ‘How to Train Your Dragon’ trilogy, brave young Viking Hiccup and his fire-breathing Night Fury buddy, Toothless, find themselves facing their biggest challenge yet: raging dragon hormones. Pulling off a rare three-peat, ‘How to Train Your Dragon: The Hidden World’ is a tender, spirited, coming-of-age CG-animated feature that proves every bit as emotionally resonant and artistically rendered as its 2010 and 2014 predecessors, if not even more so. Credit that evident quality control to returning director-screenwriter Dean DeBlois, again finding inspiration from Cressida Cowell’s children’s books (there are a dozen in all) and an engaging voice cast headed by Jay Baruchel and America Ferrera. The DreamWorks Animation production (the first of the series to be released through Universal Pictures) won’t arrive on North American shores until February 22 following numerous release date revisions, but it will be first touching down in Australia on January 3, where it should set the stage for worldwide box office returns that will be anything but toothless. 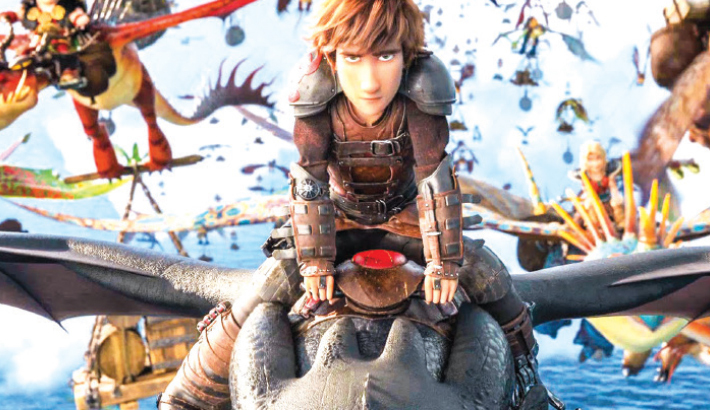 Picking up a brief time after where the last installment left off, the storyline finds Baruchel’s Hiccup, having taken over the title of tribe chieftain from his late father, Stoick (Gerard Butler, in flashback), successfully following through his dream of seeing humans and dragons living together in harmony. Perhaps a bit too successfully. Working in concert with his intended, the fearlessly accomplished Astrid (Ferrera), his recently rediscovered mom Valka (Cate Blanchett) and fellow rookie alpha male Toothless, Hiccup and company have been busily freeing caged dragons and bringing them back to the increasingly cramped Isle of Berk. But relocation possibilities take on an increased urgency with the arrival of the villainous Grimmel (F. Murray Abraham), who is hell-bent on destroying their utopian paradise. As the villagers and their scaly neighbors beat a hasty retreat in search of a hidden world previously thought to exist only in myth, Toothless finds himself increasingly distracted by a seductive, pure white lioness of a dragon known as Light Fury. Their bond ultimately forces Hiccup, already wracked with self-doubt, to reassess the realities of his own relationship with Toothless. It turns out Hiccup isn’t the only one to have matured over the past several years since we last saw him - so, too, have the opulent, computer-generated visuals, which have always been a hallmark of the franchise. Here, the technology reaches notably impressively detailed new levels, from the wispy stubble on Hiccup’s chin to cascading waterfalls, and, most notably, photo-realistically flickering flames, all gorgeously bathed in light and shadow with the assistance of visual consultant Oscar-winning cinematographer Roger Deakins (‘Blade Runner 2049’). Also worthy of mention is a lovely ballet of a mating dance sequence between Toothless and the Light Fury, who admittedly sort of looks like a preening kitty crossbred with a ‘My Little Pony’. But who’s to argue with whatever floats a frisky dragon’s boat? Once again, the element of comedy also plays a significant role in the adventure, but just like the darker dramatic underpinnings at work here, the humour also feels somewhat edgier than before. All said, by the time ‘How to Train Your Dragon: The Hidden World’ nears the end of its Harry Potter-esque closing trajectory, in which Hiccup must learn how to let go, the bittersweet result will have audiences finding it equally hard to say goodbye.